McDonald's is releasing "vintage" style American burgers in fries in Japan as part of a limited time promotion. The fries—called "Classic Fries with Cheese"—look icky. Sure, cheese fries themselves look kinda icky! But these aren't cheese fries. There's not melted cheese goodness to be found. Above, you can see the McDonald's promotional image, which, of course, looks nothing like the real meal. Of course! These are priced at 350 yen or US$3.35. On Twitter (via Matome), some people are saying the fries are "overpriced," "not tasty", and even "heartburn inducing." 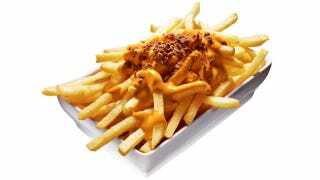 Others, however, seem to enjoy the fries, saying that the fries taste much better than they look. I would very much like to speak with those people. Then, feed them real cheese fries.